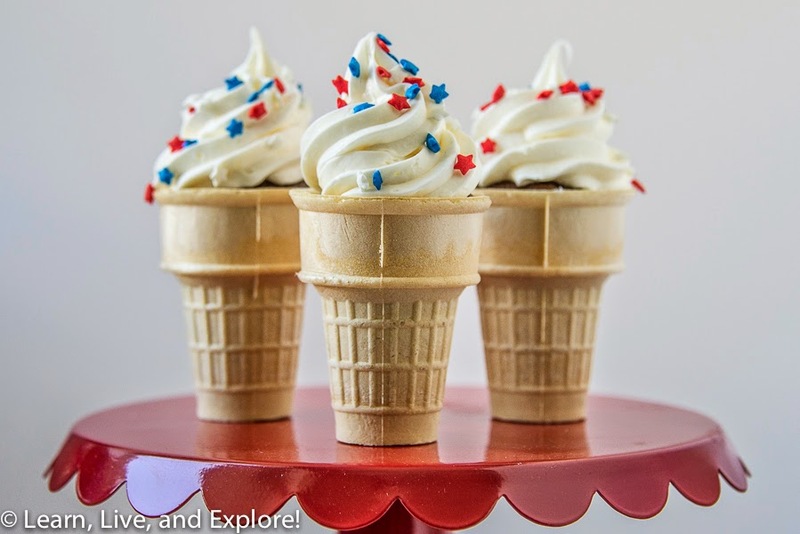 Ice Cream Cone Cupcakes ~ Learn, Live, and Explore! A quick search on the internet, especially Pinterest, and you're sure to find various cupcakes baked in ice cream cones. 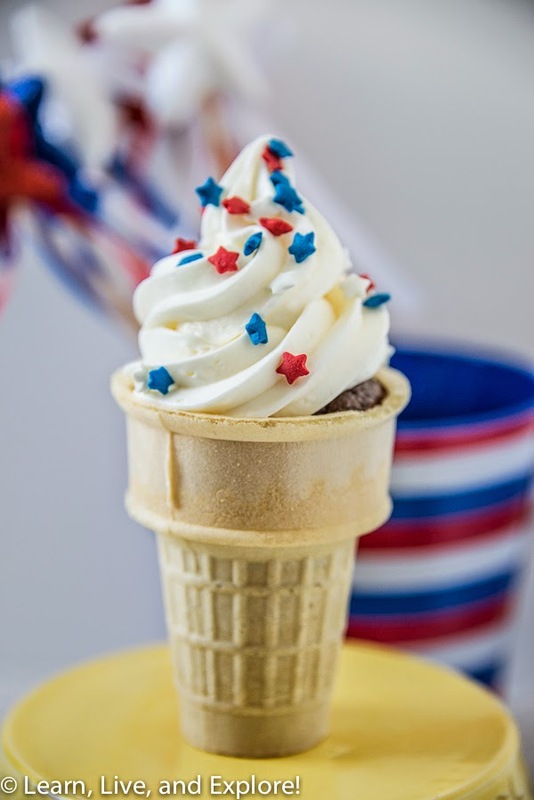 I wanted to try this out, and with the 4th of July holiday I made my ice cream cone cupcakes in a patriotic theme. 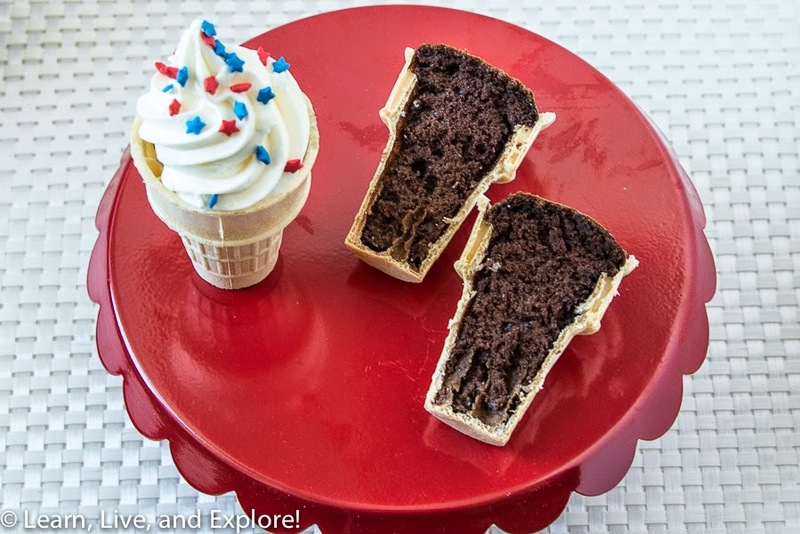 The most helpful hints I found were from Sweetopia, specifically the use of an upside-down aluminum pan with holes cut out for the cones to sit in while baking. Not only did this keep the cones upright, but it was also useful for frosting. One note, give yourself a little more than the suggested centimeter from the top of the cone - my first batch had too much batter and dripped over the cone lip. Also, no need to make a cake batter from scratch. I used a box cake mix and started testing the doneness with a toothpick around the early part of the suggested baking time range, but ended up keeping them in towards the back end of the range. Continuing with the keeping it simple theme, the frosting is simply from a can! Hey, it's a holiday, I'd rather be socializing than baking today! Which reminds me of one other point, I can already tell that these cupcakes must be made on the day of the event because the cone will start to be impacted from the cake moistness.